Posted on 10/9/2012, 9:02 am, by rackycoo, under Holidays. Whether you’re planning on having a Halloween party or just want a fun dinner with the family, here are some great ideas to make your Halloween meal extra spook-tacular! 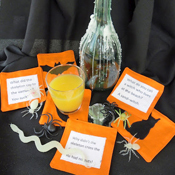 Have Halloween party favors for all your guests. frecklesinoureyes painted cardboard toilet paper rolls in in Halloween themes and filled them with candy. These are adorable! Set pumpkin placeholders at each place at the table. jillybeans made these with fimo clay and twisty wire. These coasters by Jillinamillion will liven up the conversation! Each one has a Halloween icon on the front, and a Halloween joke on the back. 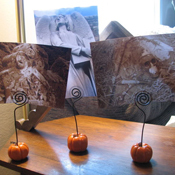 You’ll need a spooky centerpiece! 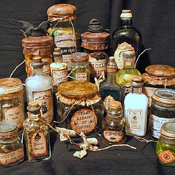 Make some wonderful apothecary jars. In her post on Craftster, Saskartgirl includes printable downloads of the labels, plus directions on making the bottles shown here. Don’t forget to decorate the room! Here’s a spooky banner idea from jillybeans. Now your Halloween decor is complete. 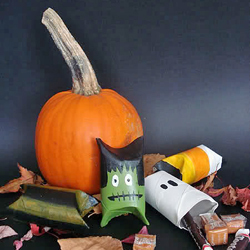 This October, Craftster is Halloween central! For these and more great ideas for all things Halloween, search the Craftster tag cloud. Stay spooky! 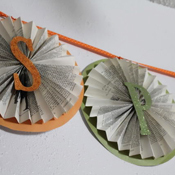 « Mr X Stitch Presents: Beefranck’s Emporium – Phat Quarter Book Swap Part 3!